Over the past couple months, Scholastic DVDs have been piling up in my office. Included in the stack are Max & Ruby’s Max’s Chocolate Chicken , the new ASL sign language formatted videos – a simply marvelous idea – for the classic Goodnight Moon , and The Wheels on the Bus Sing-Along Travel Kit , a clever repackaging of familiar tales with crayons, activity book, and sing-a-long CD. The summer just isn’t the time I want my kids on the couch staring at the television (unless they were staring at World Cup matches), so the DVDs have sat and waited for a heavy rain, or, this week, back to school for the Bear. This means I’ve now got the Mouse alone, or better said, she doesn’t have her best friend and playmate around during the daytime. Cue up the DVD player! Out this week is the 3-pack of DVDs collected under the Back to School banner. The highlights of this set include Barney Saltzberg’s lighthearted “Crazy Hair Day”, narrated by Scrubs star Zach Braff, Jane Yolen’s “How Do Dinosaurs Go to School”, and one of the Bear’s all-time favorites, “Shrinking Violet”. 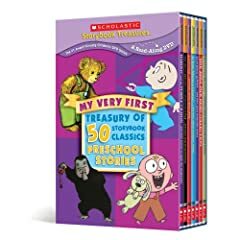 Just as with many Scholastic Treasury DVD sets, most all of these moving storybooks have appeared elsewhere on other compilations. But this set, pegged to the start of a new school year, is handy and timely and quite enjoyable. The three DVDs here are organized into three easy-navigable categories: Slightly Scary (The Teacher/Librarian/Gym Teacher from the Black Lagoon), School Adventures (Miss Nelson Has A Field Day/Is Back), and Funny School Adventures. If you’ve got a soon-to-be kindergartner nervous about heading to school for the 1st time or, like me, a kid left behind while her older sibling is gettin’ all smart and stuff, Scholastic’s Adventures At School could be a nice addition to your DVD collection. Thank you for the posting! I had no idea my book, Crazy Hair Day was part of a collection. This sounds like a great idea to bundle school stories together. 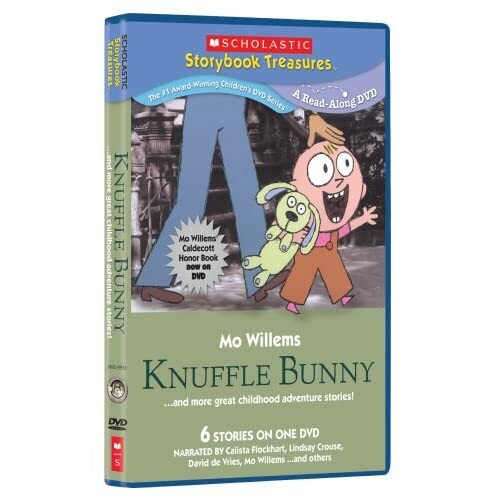 I have been so impressed with the quality of the animation from Weston Woods/Scholastic, I am sure the entire DVD is amazing….As an author and illustrator, it’s an honor to have one of my books produced like this.